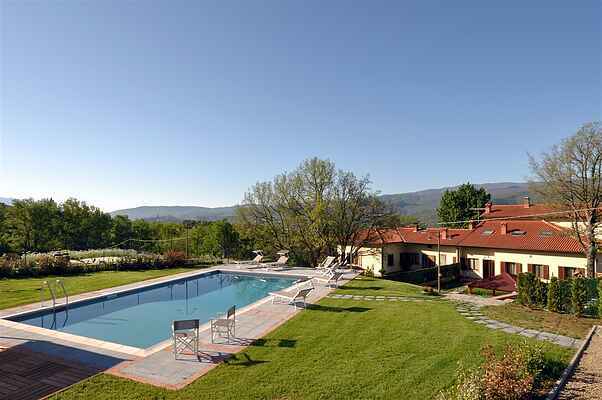 The "Golf Club Casentino" is placed 5 km from the house and is situated on a scenic hillside of incomparable beauty at an altitude of 500 metres. With your look you can embrace the whole Casentino, the green heart of Tuscany, nowadays National Park. From the stone cottage used as Club-House and restaurant you can space on the whole route of the course. Ideal for golfers of every category who wish to test, completely relaxed, their technical skills and precision rather than power. The golf course consists of 9 holes for a total of 2775 metres and 36 pars. In the villages of Pratovecchio and Stia, which are 3 km from the house, you can find all kind of shops and restaurants where to taste typical local dishes. In Stia there is also a big supermarket (Coop). At about 15 km from the house there is the commercial centre "Casentino", placed in the village of Bibbiena. Public transports leave from the village of Pratovecchio (3 km), so your personal car is required. Villa Casentino is composed of 3 bedrooms, 2 double bedrooms and 1 bedroom with 2 single beds. The rooms have been furnished with taste and high-quality materials: the pictures talk to themselves. Moreover, in addition to the 3 bedrooms there is also a double foldaway bed in the living room to have 2 additional beds as comfortable as regular beds. In conclusion there are 8 sleeping places. Bed linen are included in the rental price. There are 2 bathrooms with large pleasant “rain showers”. Please note towels are provided and included in the rental price. - Possibility to ask for baby beds, cots and highchairs.